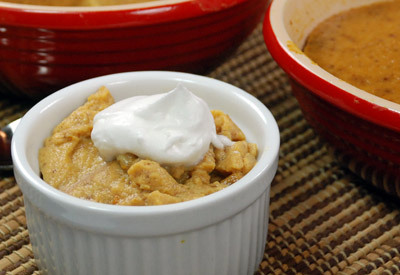 In a medium bowl, combine eggs, pumpkin, sugar, cinnamon, cloves, nutmeg and orange peel; stir in evaporated milk. Spray a 1- quart oven proof casserole dish (or two smaller oven proof dishes) with nonstick cooking spray; fill with pumpkin mixture and cover tightly with foil. Place dish(es) in slow cooker. Pour warm water around dish(es) to measure 1- inch deep. Place lid on slow cooker and cook on the high-heat setting until knife inserted into center of the custard comes out clean; about 1 3/4 to 2 hours. Serve custard warm or cold topped with whipped cream.